Home News Smartphones Alcatel ONE TOUCH 997D Explore and 993D Insight PRICE DROP! PRICE SLASH! 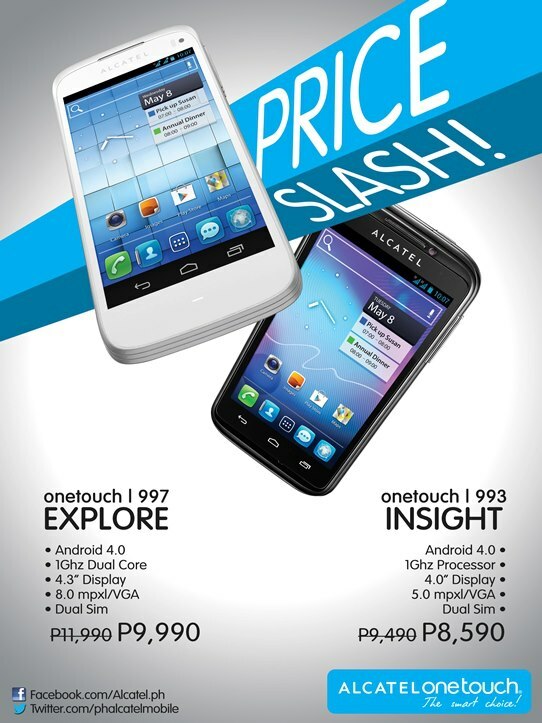 Alcatel Mobile Philippines just announced on their Facebook page a price drop of their Android ICS line up, the Alcatel ONE TOUCH 997D Explore for Php9,990 (From Php11,990) and 993D Insight for only Php8,590 (From Php9,490)! Nothing gets hotter than the price drop! So what are you waiting for? Check out these phones now! More details after the jump.